My husband is a certified cookie monster, so we're always trying out new cookie recipes in our kitchen. Now, the Toll House recipe has been my "tried and true" chocolate chip cookie recipe for years, but we discovered a "Perfect Chocolate Chip Cookie" recipe from Cook's Illustrated, and with a name like that, we had to try it. The ingredients are relatively similar to the Toll House recipe with minor variations. Possibly the most interesting and valuable piece of information in the recipe was related to the actual baking of the cookies. They warned against baking "in batches." 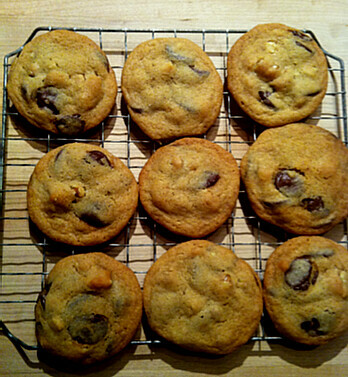 "Bake cookies 1 tray at a time until cookies are golden brown and still puffy, and edges have begun to set but centers are still soft, 10 to 14 minutes, rotating baking sheet halfway through baking. Transfer baking sheet to wire rack; cool cookies completely before serving....Baking two trays at a time may be convenient, but it leads to uneven cooking. The cookies on the top tray are often browner around the edges than those on the bottom, even when rotated halfway through cooking." I'm the kind of nutcase who hovers around the oven while my cookies are baking, so with a timer and some attentiveness I managed to rotate the trays as suggested. It made a RADICAL difference in the consistency of the cookies. I've adopted this technique for other cookie recipes, and it works!